Many essential minerals have very specific functions in the plant cell processes. When in short supply (deficient) the plant shows certain characteristic symptoms, but these symptoms tend to indicate an extreme deficiency. To ensure optimal mineral supplies, growing media analysis or plant tissue analysis (see p377) can be used to forecast low nutrient levels, which can then be addressed. Nitrogen is a constituent of proteins, nucleic acids and chlorophyll and, as such, is a major requirement for plant growth. Its compounds comprise about 50 per cent of the dry matter of protoplasm, the living substance of plant cells. Deficiency causes slow, spindly growth in all plants and yellowing of the leaves (chlorosis) due to lack of chlorophyll. Stems may be red or purple due to the formation of other pigments. The high mobility of nitrogen in the plant to the younger, active leaves leading to the old leaves showing the symptoms first. Phosphorus is important in the production of nucleic acid and the formation of adenosine triphosphate (see ATP p89). 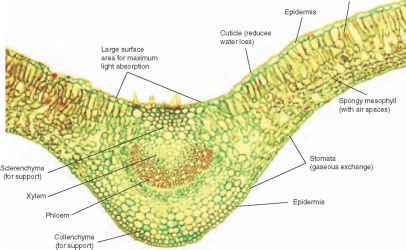 Large amounts are therefore concentrated in the meristem. Organic phosphates, so vital for the plant's respiration, are also required in active organs such as roots and fruit, while the seed must store adequate levels for germination. 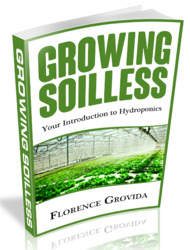 Phosphorus supplies at the seedling stage are critical; the growing root has a high requirement and the plant's ability to establish itself depends on the roots being able to tap into supplies in the soil before the reserves in the seed are used up (see p367). Deficiency symptoms are not very distinctive. Poor establishment of seedlings results from a general reduction in growth of stem and root systems. Sometimes a general darkening of the leaves in dicotyledonous plants leads to brown leaf patches, while a reddish tinge is seen in monocotyledons. In cucumbers grown in deficient peat composts or NFT, characteristic stunting and development of small young leaves leads to brown spotting on older leaves. Potassium. Although present in relatively large amounts in plant cells, this mineral does not have any clear function in the formation of important cell products. It exists as a cation and acts as an osmotic regulator, for example in guard cells (see p125), and is involved in resistance to chilling injury, drought and disease. Deficiency results in brown, scorched patches on leaf tips and margins (see Figure 21.4), especially on older leaves, due to the high mobility of potassium towards growing points. Leaves may develop a bronzed appearance and roll inwards and downwards. Magnesium is a constituent of chlorophyll. It is also involved in the activation of some enzymes and in the movement of phosphorus in the plant. Deficiency symptoms appear initially in older leaves because magnesium is mobile in the plant. A characteristic interveinal chlorosis appears (see Figure 21.5), which subsequently become reddened and eventually necrotic (dead) areas develop. Calcium is a major constituent of plant cell walls as calcium pectate, which binds the cells together. It also influences the activity of meristems especially in root tips. Calcium is not mobile in the plant so the deficiency symptoms tend to appear in the younger tissues first. It causes weakened cell walls, resulting in inward curling, pale young leaves, and sometimes death of the growing point. Specific disorders include 'topple' in tulips, when the flower head cannot be supported by the top of the stem, 'blossom end rot' in tomato fruit, and 'bitter pit' in apple fruit. Sulphur is a vital component of many proteins that includes many important enzymes. It is also involved in the synthesis of chlorophyll. Consequently a deficiency produces a chlorosis that, due to the relative immobility of sulphur in the plant, shows in younger leaves first. Iron and manganese are involved in the synthesis of chlorophyll; although they do not form part of the molecule they are components of some enzymes required in its synthesis. Deficiencies of both minerals result in leaf chlorosis. The immobility of iron causes the younger leaves to show interveinal chlorosis first. In extreme cases, the growing area turns white. Boron affects various processes, such as the translocation of sugars and the synthesis of gibberellic acid in some seeds (see dormancy p131). Deficiency causes a breakdown and disorganization of tissues, leading to early death of the growing point. Characteristic disorders include 'brown heart' of turnips, and 'hollow stem' in brassicas. The leaves may become misshapen, and stems may break. Flowering is often suppressed, while malformed fruit are produced, e.g. 'corky core' in apples, and 'cracked fruit ' of peaches. Copper is a component of a number of enzymes. Deficiency in many species results in dark green leaves, which become twisted and may prematurely wither. Zinc, also involved in enzymes, produces characteristic deficiency symptoms associated with the poor development of leaves, e.g. 'little leaf' in citrus and peach, and 'rosette leaf' in apples. Molybdenum assists the uptake of nitrogen, and although required in very much smaller quantities, its deficiency can result in reduced plant nitrogen levels. In tomatoes and lettuce, deficiency of molybdenum can lead to chlorosis in older leaves, followed by death of cells between the veins (interveinal necrosis) and leaf margins. Tissue browning and infolding of the leaves may occur and in Brassicae, the 'whiptail' leaf symptom involves a dominant midrib and loss of leaf lamina. What causes the lesves on cucumbers and rockmellons to roll inwards?